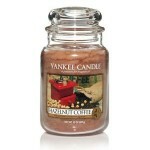 Made by the famous Yankee Candle Factory. This one is hazelnut coffee scented. The candle has a glass lid so you can close off the coffee smell when you want to ‘turn off’ the scent. This also helps preserve the scent and candle.